As the first major memory and storage breakthrough in 25 years, Intel® Optane™ technology combines industry-leading low latency, high endurance, quality of service, and high throughput that allows the creation of solutions to remove data bottlenecks, and unleash CPU utilization. With Intel® Optane™ technology, data centers can deploy bigger and more aﬀordable datasets to gain new insights from ...large memory pools. 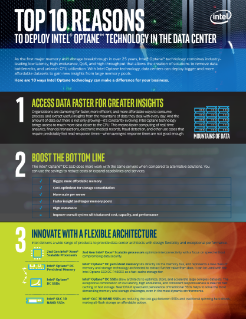 Here are just 10 ways Intel® Optane™ technology can make a diﬀerence for your business.